A two-way protected bike lane is taking shape on seven blocks of West Street in Greenpoint, part of a Brooklyn Waterfront Greenway segment that will eventually run 12 blocks between Eagle Street and Quay Street. The Department of Design and Construction began work on West Street last spring, more than three years after the design was approved by the local community board. The project also includes bioswales and high-level sewers to prevent stormwater from overwhelming the sewage system underneath the street. Con Ed is doing work on the block of West Street between Java Street and India Street. The West Street project is one of 23 segments that will eventually comprise the full 14-mile Brooklyn Waterfront Greenway between Greenpoint and Sunset Park. No other segments began construction in 2016, according to Brian McCormick of the non-profit Brooklyn Greenway Initiative. But design is complete for two segments — Flushing Avenue along the Brooklyn Navy Yard and Hamilton Avenue in Sunset Park — that are now ready for construction. 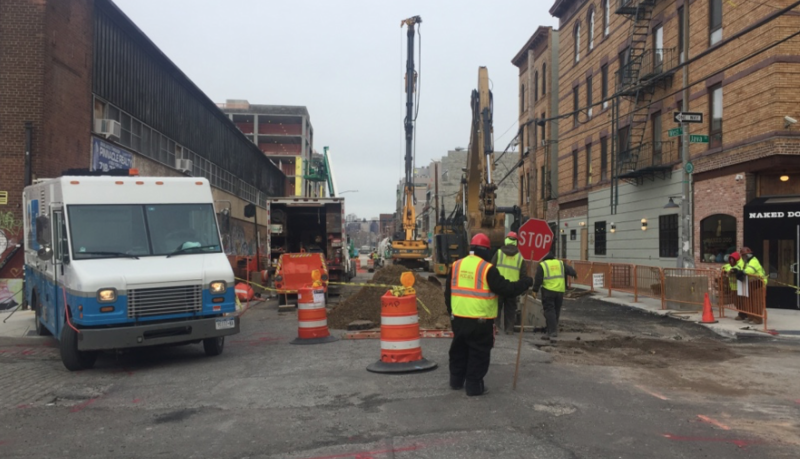 DDC says the Flushing Avenue segment will start construction this month. The design was approved by Brooklyn CB 2 in 2013, then was delayed while National Grid relocated a gas main that interfered with construction. A map showing the new segment would help tell this story. A few more design details would also be great. The picture shows a two-way painted bike lane on a one-way street. Is this lane going to be separated from traffic by anything more than paint? How are service vehicles, cops etc going to be kept from parking in the bike lane? Let’s hope they get the transitions right. Will Franklin from the end of Kent to Quay St get a good design? Williamsburg Street West and Flushing Ave corner is an unprotected, very poor design today. Will the reconstruction fix that? What about the Flushing/Navy/Sands zigzag? I didn’t see anything about it in the DDC presentation on Flushing so I fear the worst. When Will DDC Build the Brooklyn Greenway on Flushing Ave and West Street?